Last year I made a posting on Cheap fiber optic visual fault locator. 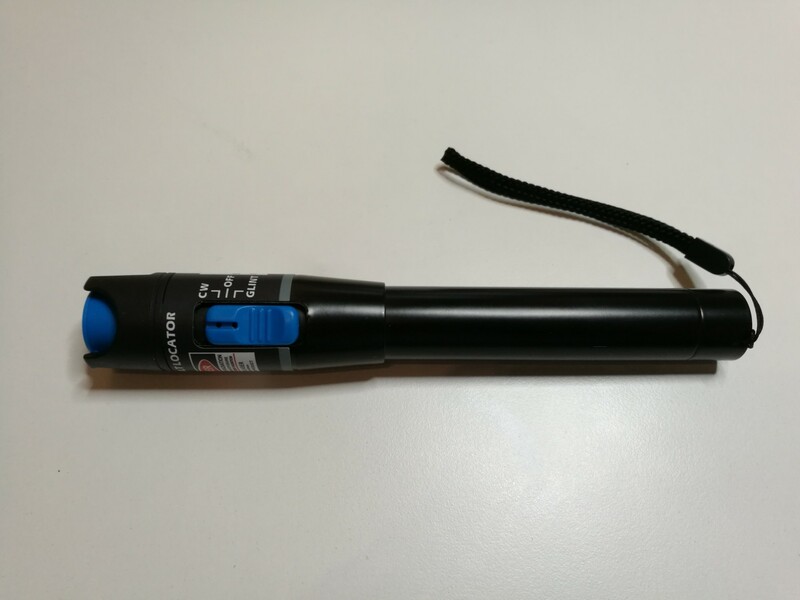 It told about 1mW 5KM Red Light Pen Visual Fault Locator Fiber Optic Laser Cable Tester Meter puts out highly visible red light into a fiber optic cable that has ST, SC and FC optical connectors.The universal fiber connector worked well with single-mode fiber terminated with SC connector. It can also be used with bare 1 mm plastic fiber (POF). Here are some videos on using this kind of fiber optic visual fault locator. This is Lecture 21 in the FOA series of lectures on fiber optics. In this video, we will review the use of visual fault locators and demonstrate how they show stress loss in a typical patchcord. This is Lecture 22 in the FOA lecture series on multimode fibers. In this lecture we’ll briefly review modes in graded-index multimode fibers then show how you can actually see the modes by using visible laser light from a VFL (visual fault locator.) Then we will show the effect of a mandrel wrap on the fiber, allowing you to actually see how the higher order modes are removed by the mandrel wrap.